Wyatt is up for sale. He is a very biddable bird dog. He is trained wing, shot, and fall. He honors other dogs on point. Natural retriever from land and water. He is whistle trained and collar conditioned. He heels very nicely as well. His range is 100 yard to 200 yards. Wyatt will make a fantastic guide dog as he’s been on quail, chucker and pheasant. 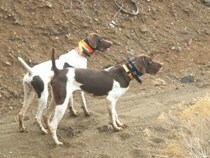 Only reason for selling this 1 1/2 year old gsp is due to family issues. He is a very special dog. PM only if serious. PRICE DROP DONT MISS OUT! I have been taking Wyatt out every weekend. He has turned into a bird finding machine. A Very stylish fully intact male that is fully trained at 18 months. He is house broken and can be left in the Kennel. Fantastic male to add to a breeding program.